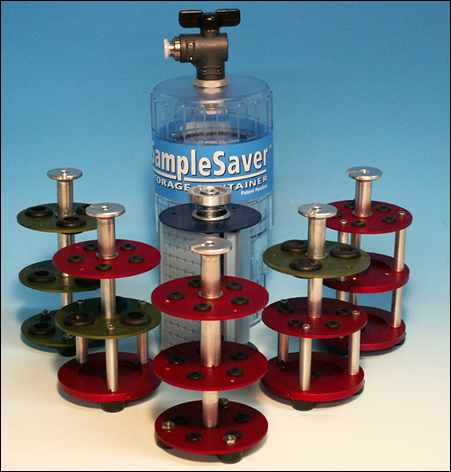 The SampleSaver™ Portable Storage Container system is a specialized container that enables a user to replace the reactive atmospheric air typically present in the container with an inert gas species. Once a sample is stored inside the inert atmosphere, the sample does not undergo reactions such as oxidation during storage and/or transportation. It is ideally suited to the preservation of microscopy samples that may undergo changes during the delay between sample preparation and analysis. The storage container can be evacuated and backfilled or purged with an inert gas. Gas can be supplied by connecting it directly to an inert gas cylinder or dry nitrogen can be boiled off of liquid nitrogen and pumped into the storage container using the Thing-A-Ma-Jug™ Cryogen Gas Supply.